I have finally returned to the world of comics with my first solo publication since 2004!! 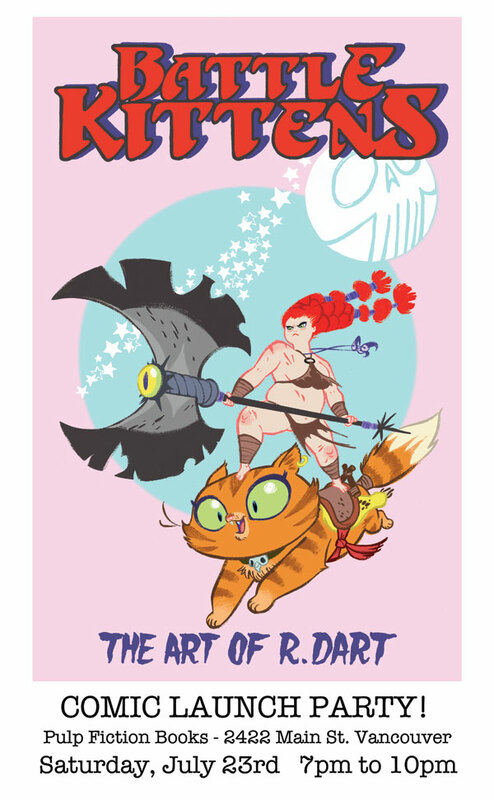 BATTLEKITTENS: THE ART OF R. DART is a handsome 56 page comic-sized collection -- 8 pages in full glorious color -- of the best from my sketchbooks and artblog from the last 3 years. This is the good stuff! Join us as we launch this limited 1000 copy print run first edition of BATTLEKITTENS this saturday at Pulp Fiction books -- 2422 Main St. Vancouver That is main and 8th ave.
Hooray! Thanks, I love it when people cross my paws with silver. rebecca! this is gonna rock! Thanks! I surely hope so. I actually haven't gotten the books back from the printer yet, so nervous. Hooray! Battle kittens love to play amongst the roos. Yeah, yeah. I'll be getting t-shirts soon too! Alas I'm in the Netherlands and won't make it to your fine event, but looking forward to a copy of your fine volume. Apparently you're not shipping to Israel so I can't get a copy? Oh cruel fate why must you taunt me so! Really, I look into that for you. Thanks Rebecca! I'm sure I'll get my precious copy eventually. And congrats on the book, of course! We now ship to Israel! It says there's no shipping fee when I order :O That can't be right. Shipping fee for UK is $7, so it should be about that to Israel as well. As much as I would like free shipping I wouldn't like robbing you of your moneys. Let me know when it's fixed and I'll order my copy right away! Thanks for helping me with this, by the way. I'm probably the only Israeli buyer, so I know it's not exactly worth the hassle. Aww can't make party but book bought! Purchased at the speed of light. You sweet little thing. You crazy, dizzy doll. I will be there to vex and venerate. Oh, James *giggle* There's going to be a barbarian trivia contest and Steve Lecoulliard will be launching his book too. Fun, fun, fun. Woohoo! Is it in fact mainly Battle Kittens stuff, or is "the best" more of a miscellany? Ordered =) So looking forward to this! I ordered it a few days a go and can't wait to be able to flip through it. Still look through your old comic often. Love your work.